"Senator Brian Birdwell Finally Gets Chance to Thank Man who Helped Him on 9/11" was first published by The Texas Tribune, a nonprofit, nonpartisan media organization that informs Texans — and engages with them — about public policy, politics, government and statewide issues. It’s been nearly 15 years since their lives were thrust together for a few chaotic moments outside the Pentagon on 9/11. Lt. Col. Brian Birdwell, now a Texas state senator, never got to thank the man who held his leaky IV line and tried to keep him conscious as he lay on a gurney, parts of his body and half his face burned beyond recognition. Col. Rob Maness never knew if the severely wounded man he’d helped had survived. That is, until last week, when their paths crossed again. In 2001, Birdwell worked for the Army and, on the morning of Sept. 11, was in an office with two colleagues watching the live footage of the Twin Towers burning. At 9:35 he stepped out to go to the bathroom, telling his co-workers he’d be right back. It was the last time he ever spoke to them. Less than 10 minutes later, as Birdwell left the bathroom, American Airlines Flight 77 barreled into the side of the building, the nose of the aircraft less than 20 yards from where Birdwell stood. He was engulfed in flames, parts of his polyester Army pants melted to his skin, his arms were skinned, and he collapsed with blood and black soot caked to his charred body. He lay there in the burning hall thinking of his wife and his teenage son and their goodbyes that morning. He tried to accept that he was dying. Yet, minutes later, he was being carried out of the building and a medic on site quickly hooked him up to an IV. That’s around when Maness, who worked for the Air Force, showed up and was instructed to hold Birdwell’s IV line, which was leaking, and to try to keep the fading man awake. Maness asked his first name. They prayed together. Maness told him he’d be okay, though it was a promise that he didn’t know for years that he’d actually kept. Birdwell was eventually taken to the hospital where he’d spend 26 days in intensive care. More than 60 percent of his body was severely burned, and he’d have 39 operations during his excruciating recovery, which took about four years, he said. In December 2001, The Washington Post profiled Birdwell, who was one of seven burn victims from the Pentagon who were treated at Washington Hospital Center. Maness spent the rest of Sept. 11 surrounded by the blood and carnage, helping the wounded get to the triage area or to a spot where they could be transported to a hospital. He remembers seeing a cab driver run into the building to try and pull people out. People from all backgrounds showed up to help, he said. He was just one of them. Both men are in politics now, Birdwell a state senator in Texas and Maness a candidate for the open U.S. Senate seat in Louisiana. They were both in Cleveland last week for the Republican National Convention. Maness requested a meeting with former Texas Gov. Rick Perry to ask advice for running in a statewide election. Perry wanted to introduce him to another veteran turned public official who had also been in the Pentagon on 9/11. He had his aides track down Birdwell. Within minutes of trading stories from that terrible day, the men realized who the other was. They were describing the same location, the same injuries, the same broken IV line. And Maness, who days after the attack wrote an “after action report” about what he had observed, had mentioned in it that he’d helped an Army officer named Brian who was badly burned, in shock and in need of a working IV. Birdwell said he never could have picked Maness out of a lineup, but he remembers distinctly the instructions Maness was given to hold his IV to keep it from leaking as he lay there still unsure whether he would live through the day. Birdwell started a nonprofit, Face the Fire Ministries, that supports burn victims and wounded service men and women. Maness helped found an advocacy organization to prevent veteran suicides. Both say their shared politics, passions and past will ensure they now stay in each other’s lives. Many people ensured Birdwell survived that day. That he got to attend his son’s high school and college graduations, and wedding last year. Not a day goes by that Birdwell doesn’t feel blessed that he was there for those major life moments. Senator Brian Birdwell Finally Gets Chance to Thank Man who Helped Him on 9/11 By Colby Itkowitz, The Washington Post July 28, 2016 It’s been nearly 15 years since their lives were thrust together for a few chaotic moments outside the Pentagon on 9/11. Lt. Col. Brian Birdwell, now a Texas state senator, never got to thank the man who held his leaky IV line and tried to keep him conscious as he lay on a gurney, parts of his body and half his face burned beyond recognition. Col. Rob Maness never knew if the severely wounded man he’d helped had survived. That is, until last week, when their paths crossed again. In 2001, Birdwell worked for the Army and, on the morning of Sept. 11, was in an office with two colleagues watching the live footage of the Twin Towers burning. At 9:35 he stepped out to go to the bathroom, telling his co-workers he’d be right back. It was the last time he ever spoke to them. Less than 10 minutes later, as Birdwell left the bathroom, American Airlines Flight 77 barreled into the side of the building, the nose of the aircraft less than 20 yards from where Birdwell stood. He was engulfed in flames, parts of his polyester Army pants melted to his skin, his arms were skinned, and he collapsed with blood and black soot caked to his charred body. He lay there in the burning hall thinking of his wife and his teenage son and their goodbyes that morning. He tried to accept that he was dying. Yet, minutes later, he was being carried out of the building and a medic on site quickly hooked him up to an IV. That’s around when Maness, who worked for the Air Force, showed up and was instructed to hold Birdwell’s IV line, which was leaking, and to try to keep the fading man awake. Maness asked his first name. They prayed together. Maness told him he’d be okay, though it was a promise that he didn’t know for years that he’d actually kept. “I hadn’t forgotten about that guy,” Maness said in an interview. “I never knew if he lived or not, but I prayed for him every day.” Birdwell was eventually taken to the hospital where he’d spend 26 days in intensive care. More than 60 percent of his body was severely burned, and he’d have 39 operations during his excruciating recovery, which took about four years, he said. In December 2001, The Washington Post profiled Birdwell, who was one of seven burn victims from the Pentagon who were treated at Washington Hospital Center. Maness spent the rest of Sept. 11 surrounded by the blood and carnage, helping the wounded get to the triage area or to a spot where they could be transported to a hospital. He remembers seeing a cab driver run into the building to try and pull people out. People from all backgrounds showed up to help, he said. He was just one of them. Both men are in politics now, Birdwell a state senator in Texas and Maness a candidate for the open U.S. Senate seat in Louisiana. They were both in Cleveland last week for the Republican National Convention. Maness requested a meeting with former Texas Gov. Rick Perry to ask advice for running in a statewide election. Perry wanted to introduce him to another veteran turned public official who had also been in the Pentagon on 9/11. He had his aides track down Birdwell. Within minutes of trading stories from that terrible day, the men realized who the other was. They were describing the same location, the same injuries, the same broken IV line. And Maness, who days after the attack wrote an “after action report” about what he had observed, had mentioned in it that he’d helped an Army officer named Brian who was badly burned, in shock and in need of a working IV. “We figured it out in a couple minutes of talking to each other,” Maness said. “I started crying. It was a very positive emotional release for me.” Birdwell said he never could have picked Maness out of a lineup, but he remembers distinctly the instructions Maness was given to hold his IV to keep it from leaking as he lay there still unsure whether he would live through the day. “We had a really big hug that had the gravity and emotion of two comrades in arms,” Birdwell said. 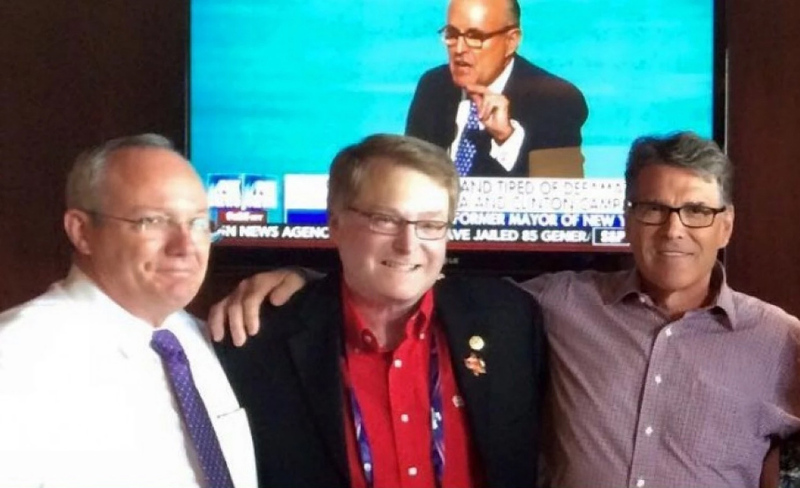 “This wasn’t just someone in the building, this was someone who the Lord had as close to me 15 years ago as he was standing next to me in the room there with Governor Perry.” From left, Rob Maness, Brian Birdwell and former Texas governor Rick Perry. Courtesy of Rob Maness Birdwell started a nonprofit, Face the Fire Ministries, that supports burn victims and wounded service men and women. Maness helped found an advocacy organization to prevent veteran suicides. Both say their shared politics, passions and past will ensure they now stay in each other’s lives. Many people ensured Birdwell survived that day. That he got to attend his son’s high school and college graduations, and wedding last year. Not a day goes by that Birdwell doesn’t feel blessed that he was there for those major life moments. “Rob played a part in me being able to do those things and that’s pretty special,” Birdwell said. “It’s a whale of a fraternity with one hell of an initiation.” "Senator Brian Birdwell Finally Gets Chance to Thank Man who Helped Him on 9/11" was first published at by The Texas Tribune, a nonprofit, nonpartisan media organization that informs Texans — and engages with them — about public policy, politics, government and statewide issues. Link back to the original article, which is located at https://www.texastribune.org/2016/07/28/he-always-wondered-if-man-he-helped-911-had-lived/.